Sammy M. Mugambi, M.D. - Southwest Atlanta Nephrology, P.C. Home >> Providers >> Sammy M. Mugambi, M.D. Sammy M. Mugambi, M.D., is a native of Nairobi, Kenya who graduated and received his Medical Degree from the University of Nairobi, College of Health and Sciences. 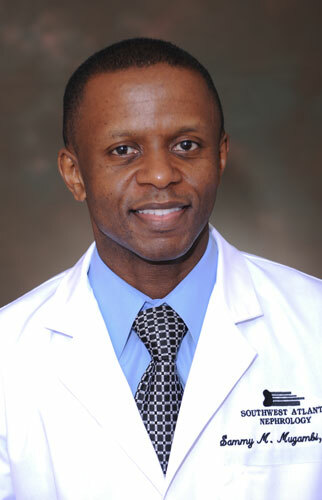 Dr Mugambi completed his internal medicine residency at Drexel University/MCP Hahnemann University in Philadelphia, PA. He subsequently joined the division of hospital medicine at Emory Healthcare where he also served as an instructor at The Emory School of Medicine. He completed a nephrology fellowship at the Medical University of South Carolina prior to joining Southwest Atlanta Nephrology. He is double board certified in Internal medicine and Nephrology. In 2010, he published a study called: Bacteremia, Sepsis and Peritonitis with Pasteurella Multocida in a Peritoneal Dialysis Patient. Dr. Mugambi loves to travel and is an avid photographer.